This dish comes from one of my Pot Roast Food Redesigns. Typically, the first night I make a 4-5 pound pot roast in the slow cooker, enough for lots of leftovers. The second night it turns into either Beef Empanadas, Beef Enchiladas or possibly a French Dip Sandwich. Cooking once and creating multiple meals out of it is what I call a “Food Redesign”. I take what you would technically call “leftovers” and turn it into another meal. Let pastry dough come to room temperature for about 20 minutes before you try to roll it out. Lay out pastry dough on a flat surface, one on top of the other and then use a pizza cutter to cut it into quarters. You should have 8 pieces total. 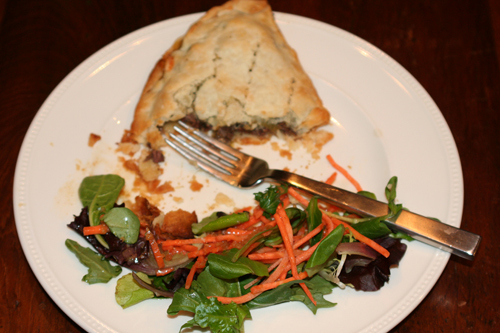 Put ¼ each of beef, cheese, and chiles on top of the bottom pastry piece. Top with matching pastry piece and just mash with fingers, or a fork the get the edges together. Cook for 10-15 minutes or until golden brown. ** We eat 2 and freeze 2 (uncooked) for later. To freeze, I first put them in between wax paper, then I will place them in a freezer bag.